This article is about the item from the Mario Kart series. For the unrelated but identically named item, see Spiny Shell (red). For the unrelated item that is known by the same name, see Blue Shell. A blue Koopa shell with spikes and wings (at times). The Spiny Shell (also known as Blue Shell) is an item from the Mario Kart series. Its first appearance is in Mario Kart 64. 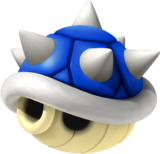 The Spiny Shell appears in many Mario Kart games as an item from an Item Box. Its general purpose is reminiscent of a Red Shell, except that it targets the player in first place (or the leader of the race), and inflicts more damage to the targeted racer. Its function varies slightly from game to game. Aside from the Mario Kart games, the Spiny Shell is a power-up in some Mario sport games. It is easily one of the most powerful items in Mario Kart due to the random nature of its appearances, its main function of going after the leading racer, the fact that it is generally unavoidable without the use of certain items, and the utter effectiveness of its attack and blast radius. The Spiny Shell is first introduced in Mario Kart 64. In the game, the shell has spikes on it and travels along the ground. It is essentially a blue version of the common Spiny Shell. Any player outside first place can receive this item. However, the Spiny Shell is the rarest item in the game. Once fired, the Spiny Shell will travel straight forwards for a second or two. If it hits an obstacle during this time it will be destroyed, so care must be taken to avoid wasting it. After a few seconds the shell will begin traveling along the ground, following the track ahead of the shooter. Any karts that the Spiny Shell hits will be thrown into the air. This can be avoided by moving out of the way, as it will not target anyone except the leader of the race. Once it gets to the leader, it will crash into them and disappear, sending them flying into a fairly long distance (enough to fling them over some barriers that normally cannot be jumped over). The shell makes a highly distinctive siren sound while traveling. While it normally remains sliding along the track, the Spiny Shell will take to the air if required to continue its chase, soaring over gaps and jumps. A particularly strange case occurs on Banshee Boardwalk: the shell will fall off the edge of the track just before the house, resulting in it making a corkscrew flight to get back on. In other cases, before entering the haunted house, it can circle around the sign that says "WELCOME". If the Blue Spiny Shell strikes an invincible racer it will be destroyed without the racer being damaged. If the leader is invisible, it will simply pass through them, though it may then simply make another lap of the course and hit them afterwards. The shell can be dragged behind a kart like other single shells. In this position it will destroy any opposing items it touches, as well as cause opponents to crash. It cannot be fired backwards. Using the shell while in first place will result in it turning around to hit the thrower after its straight shot. If a player gets a sideways Item Box, they will get a Spiny Shell each time. However, there are only two of these. One is in Luigi Raceway, where there is a balloon that will dip down with an item box hanging on the bottom. Another is in Koopa Troopa Beach, there is a large rock with a single item box on its top with a narrow ramp before it. In the Mario Kart 7 remake of both courses, this special item box is no longer present, and is replaced by a regular one in Luigi Raceway, and a single Coin in Koopa Troopa Beach. The item serves the same function as in Mario Kart 64 for Mario Kart: Super Circuit for the Game Boy Advance, although the shell has a darker blue color. Like before, it makes a distinct siren sound when traveling. Like the Red Shells in the game, it can be dropped behind the player and will activate only if the kart in the first position passes directly by it. The Spiny Shell is also easier to avoid; if the player jumps over an abyss or over a previous section in the track (like the jump in Mario Circuit 2) the shell will fall in the abyss or crash into the wall. The impact of the Spiny Shell no longer cause the leader to crash and thrown off, instead they will spin out and stop in the spot they were hit. This trait is later reused for the POW Block in Mario Kart Wii and for the Spiny Shell in Mario Kart 8. In Mario Kart: Double Dash! !, the Spiny Shell is changed significantly. It is a standard item that any player in fourth place or lower can obtain. In this game, the shell appears with a pair of wings that allows the item to fly instead of sliding over the ground, which lets it skip any obstacle found in the course. The shell now makes a hissing noise as it launches. When thrown, the shell flies at incredibly fast speeds to the current head racer, bypassing all of the other positions. After finding its target, the shell hovers behind the vehicle to home in on it, then charges straight into it. Double Dash!! is the first game where the Spiny Shell explodes on impact and throws the racer up into the air, also causing their kart to backflip. The blast is similar to a Bob-omb, and it can leave racers itemless if they're thrown into the air, but it's colored blue and somewhat larger. This trait is kept for subsequent games. Other racers that are caught in the explosion will spin out and drop certain items onto the road, while destroying any items already on the ground. The Spiny Shell always goes for the leading player in the race (even if it is the shooter). Therefore, if the player in first already crossed the finish line, any Spiny Shell shot after that point will go to the active leader of the race (in this case the second-place racer). Thus, once the player in second crosses the line, the shell will target the player in third, and so on. Additionally, once a player holds a Spiny Shell, other racers cannot receive another shell until the player has used it and hit the target. This rule is kept for later games as well. To avoid the Spiny Shell, the player has multiple possibilities. He or she can either use a perfectly-timed Mushroom, use a Star to make the item completely harmless, or by skillfully performing a Mini-Turbo by drifting, which will sometimes cause the Spiny Shell to spin around the player and crash into a wall. 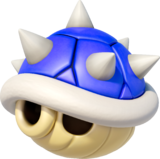 In Mario Kart DS, the Spiny Shell has not changed since its redesign in Mario Kart: Double Dash!!. The Spiny Shell works in the same manner as in Mario Kart: Double Dash!!. It is obtainable from fourth to seventh place. Once fired, a Spiny Shell flies following the road to reach to the leader. Once locating its target, the shell flies around briefly over its target and falls over the vehicle before exploding on impact, sending the vehicle thrown upwards and destroy the items held by the racer. Almost unavoidable, a player can avoid the explosion by using invincibility items like a Star, a Bullet Bill, or Boo. Tumbling as a result of getting hit by a Banana Peel or Fake Item Box will also prevent the damage received by the explosion. Finally, the shell can be avoided by skillful use of a Mini-Turbo; karts with a high handling (like the Dry Bomber) can do it by a timed hop right after releasing the Mini-turbo. The Spiny Shell makes an appearance in Mario Kart Wii. Its function is identical to Mario Kart: Double Dash!! and Mario Kart DS, and it can be obtained if the racer is anywhere from 4th to 8th place (middle ranked positions). Its rarity is similar to that of the POW Block. If the player drops out and sees the Spiny Shell flying to that area in courses like N64 Sherbet Land, the shell will make a U-turn and still target the racer in 1st place. If a player is targeted for attack by a Spiny Shell or is in the vicinity to be hit by the blast, the player can avoid the attack by means of a Star, a Mega Mushroom, a Bullet Bill, or a well-timed Mushroom; by getting hit by a POW Block; or by passing through a Barrel Cannon, a Launch Star found on Rainbow Road, or the wide ramp in DK's Jungle Parkway. It is even possible to drop a Banana at a very precise time during the drop after a jump, which causes the Banana to collide with the shell and spare the target. Doing a trick off a ramp at the perfect time can also result in avoiding a Spiny Shell. Also, if the player is in first when the shell is fired and drops out of that position, the shell will still attack that player. In team play, the Spiny Shell will aim for whoever on the opposing team is farthest in front, ignoring and not damaging anyone on the user's team (so it will target the racer in fourth if the first three racers are on the user's team). This is the only time where a player can launch a Spiny Shell in first and not get targeted by it. For the first time, the item is also available in Battle Mode, flying straight to the opposing team's highest-scoring player after a short delay. The item is much rarer in Battle Mode than VS and Grand Prix modes, and only appears if there is a very large score difference between the user and the leader. The Spiny Shell makes its appearance in Mario Kart 7. The shell is now wingless, like its first incarnation, and is larger than previous versions. Unlike the original incarnation, however, this and all later versions have separate hexagonal plates on the carapace akin the winged design. Like before, it explodes on impact with the leading racer, but this time also hits other racers in its way, since it travels along the ground and spins like the original appearance. Its rarity is on par with Lightning. This item can be obtained anywhere from 5th to 8th place, with CPU-controlled players not being able to obtain it in 8th place. The explosion is also weaker than in Mario Kart Wii and disappears faster; this time, it knocks racers sideways, although this can potentially cause them to fall off the course. Additionally, being in flight from a cannon or similar object no longer provides immunity against the Spiny Shell. All of the racers hit by the shell drop Coins (like any other item), but unlike in the past Mario Kart installments, the Spiny Shell no longer destroys the items carried by the racer, except for items being dragged by the racer at the time of the explosion. Unlike in Mario Kart Wii, the racers in the front hit by the explosion do not get thrown off the ground. Instead, they crash and roll over sideways, similar to being hit by a racer under effect of a Bullet Bill or a Star. However, the impact is still powerful enough on courses where it's possible to fall off, such as Bowser's Castle and Rainbow Road. If the player is hit when gliding, the glider retracts itself and the kart tumbles in the air before falling, usually losing some position. Unlike in Mario Kart Wii the Spiny Shell is easier to avoid by simply dropping out of first place before the item is launched, or falls off the course, though it is much harder to avoid it with a Mushroom, as the item now explodes ahead of the targeted racer. Even being hit by a perfectly-timed Shell, Banana, invincible racers, or Lightning will nullify its effects. Additionally, racers behind the first-place racer can avoid the shell by swerving out of its way. The Spiny Shell cannot travel further than a set distance: if it exceeds the distance, then the shell disappears. This can be demonstrated on Rock Rock Mountain, where the Spiny Shell can easily miss the player if the player flies over it at the last glider jump; the shell does not go another lap in attempt to hit the player again. It now also has a new sound effect when launched, rather than the traditional hissing noise of previous versions, although the aforementioned sound can still be heard slightly when it's about to explode. In addition, the "incoming item" warning sound from Mario Kart Wii now can only be heard when either a Spiny Shell or Bullet Bill is launched. The Spiny Shell returns in Mario Kart 8 and Mario Kart 8 Deluxe. It retains the Mario Kart 7 design but has a brighter, royal blue color. Unlike in Mario Kart 7, the shell now once again flies, although much lower to the ground and still able to hit racers on its path. Like in previous games, it can be avoided by using a Mushroom, in the same way as Mario Kart 7. It can also be avoided by getting hit with another item, outrunning it, which is only possible on 200cc in Mario Kart 8 Deluxe, or by using the Super Horn, which is capable of destroying Spiny Shells in their path; the said item, however, is very rare. Like in Mario Kart 7, Spiny Shells also cannot travel further than a set distance: if they exceed the distance, then the shell will disappear. This can easily be demonstrated by playing on N64 Yoshi Valley, where the Spiny Shell can easily miss the player if it takes a path different than the player's; it will continue on its path and will not go another lap in attempt to hit the player again. It is also much less powerful in this game, with the explosion now only stopping the target in the spot he or she was hit, instead of causing them to crash or tumble, and they flip once instead of twice. This is notably similar to that of Mario Kart: Super Circuit. Due to the new item system (where it mostly depends on distance from the front runner), it is possible to get the shell from any place other than first. A Spiny Shell Collector's item is also available with the Mario Kart 8 Limited Edition bundle as well as the game disc. The Spiny Shell appears as an item in Super Smash Bros. for Nintendo 3DS / Wii U, retaining its wingless appearance in recent Mario Kart games. It hovers over the leading player (or the second-scoring player if the leading player has thrown it), and after a while, falls and explodes. Its fall speed varies, giving the target more or less reaction time to dodge. In team battles with friendly fire off, the Spiny Shell attacks the leading player in the opposing team, although with friendly fire on, it targets the leading player regardless of team affiliation. The explosion seems to be smaller than that of Mario Kart series. The spikes can also damage opponents if the shell is below them, and when it is hovering overhead. The Spiny Shell makes a return as an item in Super Smash Bros. Ultimate. An arrow denoting the color of the character who throws it now appears over the Spiny Shell. The sole change made is that in team battles with team attack on, the Spiny Shell does not go after teammates if the teammate has the most points. In Mario Hoops 3-on-3, the Spiny Shell's appearance is similar to its appearance in Mario Kart 64. The shell is a homing projectile that once thrown, chases the basketball in play and explodes upon contact in a similar fashion to a Bomb. The resulting explosion damages all players. The Spiny Shell appears as an item in Toy Field. It steals fifty coins from the leader and gives them to the user. Spiny Shells appear as items in the Dream Canoe event in the Nintendo DS version of Mario & Sonic at the Olympic Games, where their design and function is similar to that of the winged shells in Mario Kart: Double Dash! !, Mario Kart DS and Mario Kart Wii. If used, they will aim for and explode on the character in first place (or second place, if it was used by the character in first), causing them to lose three coins, though their effect can be prevented by using a Starman item. Gigantic fossilized Spiny Shells can be seen throughout the Ancient Gardens in Mario + Rabbids Kingdom Battle, where they only serve as background decoration. One such Spiny Shell also appears in front of Princess Peach's Castle after the player completes Ancient Gardens. Beep-0 jokingly comments that the team has to restore this Spiny Shell, then avoid it for the remainder of their lives. The Phantom also mentions the item in the first verse of his song. Wii U Mario Kart 8 (05/2014) The devastating blue Spiny Shell that normally appears in the Mario Kart series. This shell seeks out the lead racers and ruins his or her day. In Smash Bros., it will hover above one of the fighters before crashing down and exploding. Avoiding the impact can be challenging. In the Mario Kart series, these blue shells play a big role, tearing down the track at a frightening speed before crashing down on whoever's in first place. When thrown, it'll hover around above a fighter's head, and after a short while drop down and blow up. If you find one targeting you, get ready to dodge that explosion! The Spiny Shell seen flying above Luigi Circuit in Mario Kart: Double Dash!! Icon from Mario Kart: Double Dash!! ↑ American page about the update of Mario Kart 8 Deluxe. The Spiny Shell is referred to as Blue Shell in the update details of version 1.3.0. This page was last edited on April 3, 2019, at 21:11.